For my older brother, it was The Wizard of Oz. For my youngest sister-in-law, it was The Sandlot. For Hailey, it's Monster's, Inc. She loves that movie. She would watch it all day, every day if we let her. As soon as it's over, she asks, "Boo?" For those of you who haven't watched this movie over and over and over, Boo is an adorable toddler, about Hailey's age. Hailey loves this character. In fact, she has officially changed her name...to Boo. Whenever anyone asks Hailey what her name is, she answers, "Boo." The other day, when we called her "Hailey," she gave us this look like, "What are you talking about?" And then she set us straight: "Boo." 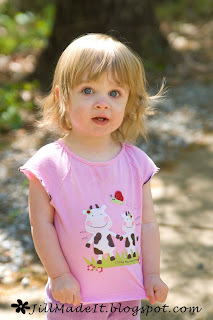 So, as per her request, whenever I refer to Hailey on this blog, I will call her by her proper name: Boo. "The name's Boo. Just Boo." Ha ha ha. Brings back memories of days long ago, when my youngest brother would watch Mary Poppins over and over and over and over and over and over . . . yeah, I haven't watched it since then, but I can still quote a decent amount of it!